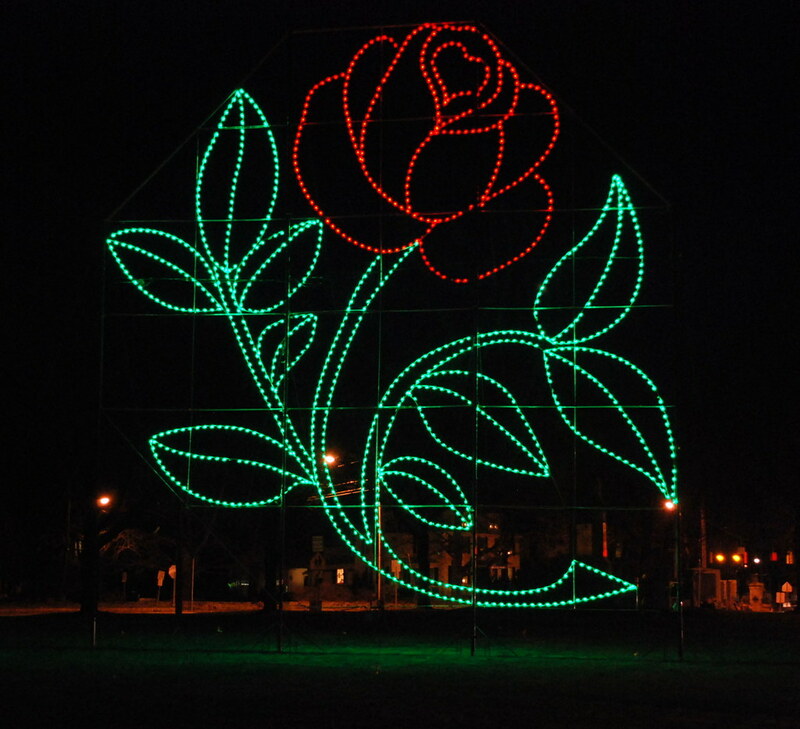 On my way home from work the other night, I couldn't help but notice that the large rose made out of Christmas lights that has graced Chelsea Parade in the past was up and lit. I don't remember it being there last year but that could be my Swiss-cheese brain not quite remembering things correctly, though I'm pretty sure if it had been up, I would have taken a picture or two. Norwich being The Rose of New England, it seems rather appropriate that there be a huge rose gracing the middle of the city and, of course, upon seeing it up and lit my first thought was that I needed to get a picture of it at some point. That first thought was immediately followed by a second thought - "but darn, it's been so cold!" Knowing that it wasn't going to get any warmer, and with a forecast for close to a foot of snow being dumped on us overnight Saturday, I decided Saturday evening to take my Nikon and venture forth into the cold evening air while I had the chance to do so without having to wade through a foot of snow to get the right angle! As you can see, there are a few lights burned out here and there that the city needs to replace at some point but it's definitely a beautiful rose even with the backdrop of street lights and such. Personally I think the city should leave it up all year but I'm sure the electricity to keep it lit isn't cheap and there's always the chance some yahoo is going to come along and vandalize it. 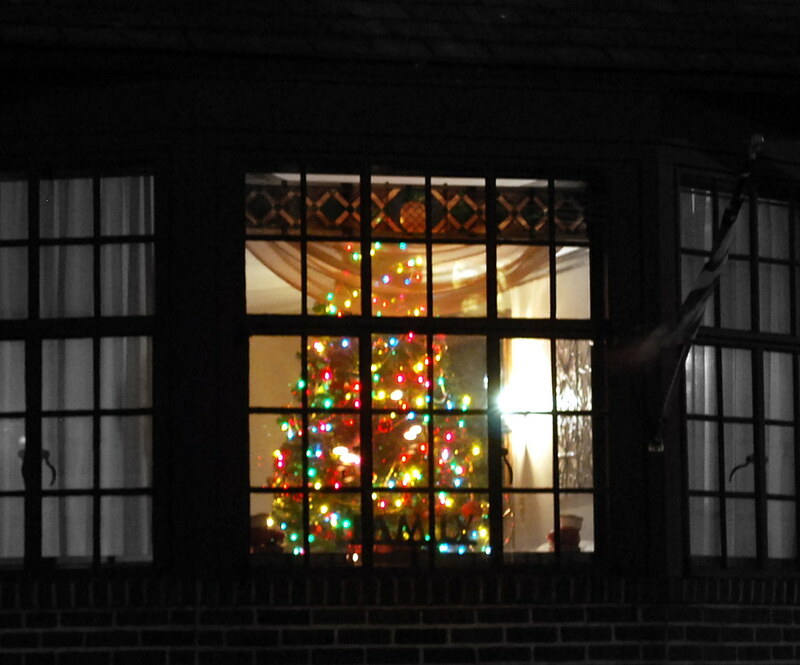 Hopefully no one looked out the windows and wondered why some strange frozen woman was taking pictures of their house but if they did, hopefully they know it was because their tree was so pretty and not because I was casing the joint for a future burglary! I love Christmas lights... they are so worth braving the cold! The rose is pretty, you can't even tell there's missing lights here and there unless you really look. I love them both. The rose is a very nice touch. I didn't know you lived in the city that's the rose of New England. I do now. Lovely photos LInda. I'm sure the homeowners would love a copy of that photo for their memory book. Unfortunately, you are right that some yahoo might define fun as destroying that rose. P.S. I put up a Christmas decoration that you and Amanda might enjoy. WOW, Linda! That rose is awesome -as is the tree in the window too! You did a great job on both those pictures. I haven't been down that way in NOrwich lately and I can't remember if they had it up last year also. I know the Church across the way usually has the Nativity set up. I wish that I could learn to take photos at night and of moving objects so they don't look blurry. My idea of taking a photography class didn't pan out, but hopefully next year I'll get to it. what pretty photos! 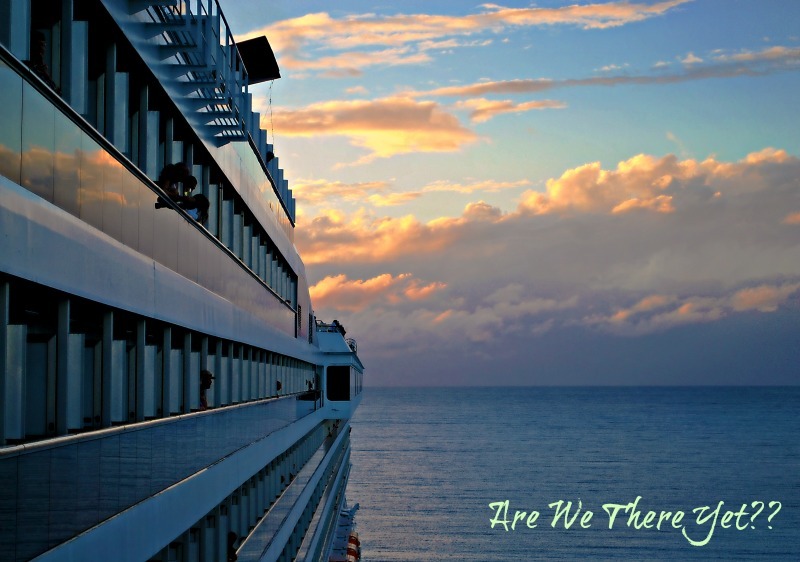 i just got caught up on all your posts while i was gone, hope jamie loves her new adventure! it might be just the very thing for her! Brave girl! Thank you for putting up with the cold long enough to take such lovley shots, and thank you for sharing them.